Yoga in the A.M. | Does This Font Make Me Look Fat? I go to a five morning a week yoga class at The Studio in St. Michaels. It starts at 7, but we all get there about 6:45 so we can hang like bats from slings, use the inversion benches and stretch out our backs with straps. This class is NOT Power Yoga. Most of us are “women of a certain age” who have knee, hip, back, shoulder, neck and wrist issues. Our instructor, Paulette Florio, is keeping us limber, flexible and strong. I sit to write, but get up from time to time to put in a load of laundry, take a turn around the garden and find some Japanese beetles to kill, or root through the freezer to looking for dinner. But it’s the sitting that makes me stiff. Yoga class keeps me moving. Sometimes for fun I go on line to see the different poses. This is always good for a laugh because there is no way my body is going to do those things! Disclaimer…photo below of a woman in the plow pose is not me. The first time I did this pose in this class I had to call for help. Seriously! I got myself folded in half and couldn’t get back up. This morning we were in plow pose using a chair as a prop and it was actually restful. Paulette helps us be better yogis by using props. My hamstrings are tight so I use really big yoga blocks. That has made a huge difference in my practice. We use the walls, folding chairs, blankets, blocks of all sizes, short and long straps, big and small balls, and bolsters. (I’ve probably forgotten some.) Paulette also shows us how we can use the props we find in our homes so we always have a studio – even when we’re traveling. There are no mirrors in Paulette’s yoga studio. That’s by design. She wants us to focus on our own bodies and is always walking around making corrections to our poses. It’s my early morning yoga class that sets me up for another day of writing, but right now it’s time for a turn around the garden. 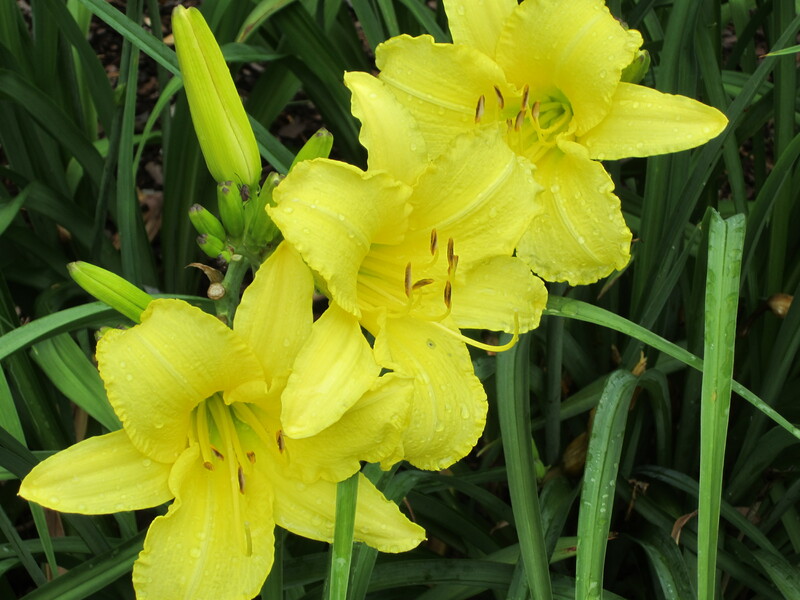 The day lilies are glistening after an early morning rain. This entry was posted in Laura Ambler, Mala Burt, Writing, Writing Tips and tagged Laura Ambler, Mala Burt, writing resources, yoga, yoga props by Mala Burt. Bookmark the permalink.